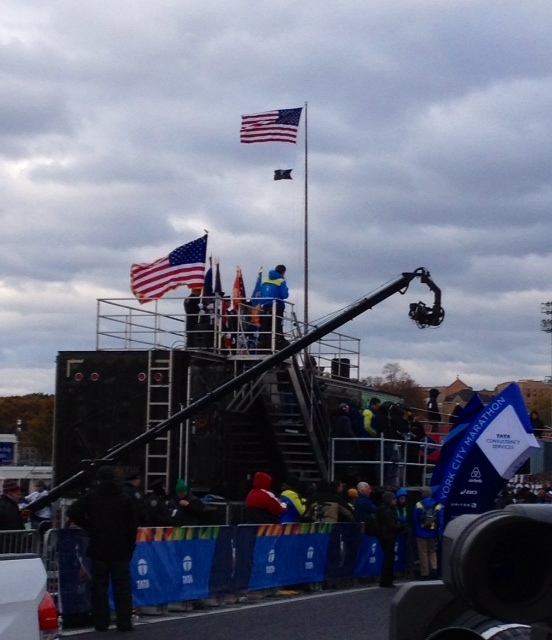 New York, New York — A cold, blustery day welcomed the 50,0000 runners at the 2014 TCS New York City Marathon. Once again I was aboard the lead men’s motorcycle camera bike providing commentary for the ESPN2 television coverage. Here is how the men’s race played out from that close vantage point. My misery index had been set the day before during a frigid, rain-drenched TV rehearsal, and I wasn’t going to be caught cold again. In the 43 degree Fahrenheit conditions with NNW winds blowing at a steady 20 – 25 mph, gusting even higher, I wore so many layers on Sunday morning I must have resembled a Russian nesting doll. From the racer’s standpoint such conditions are the functional equivalent of adding distance to the event. Last year the 48 degree temps and 15-19 mph headwinds tacked about one kilometer onto the standard 42.2K in terms of finishing time, as 2011 course record holder Geoffrey Mutai won his second title in 2:08:24. Same guy, same course, same effort, but three minutes slower than his course record 2:05:06. And since A-level male marathoners race at or near 3:00/km, conditions on November 2, 2014 might mean a full mile extra effort would be added to the already testing course. As the professional men followed their female counterparts onto the Verrazano Narrows Bridge several hundred feet above the churning gray waters below, the wind began thrashing at their singlets like an autistic preamble. 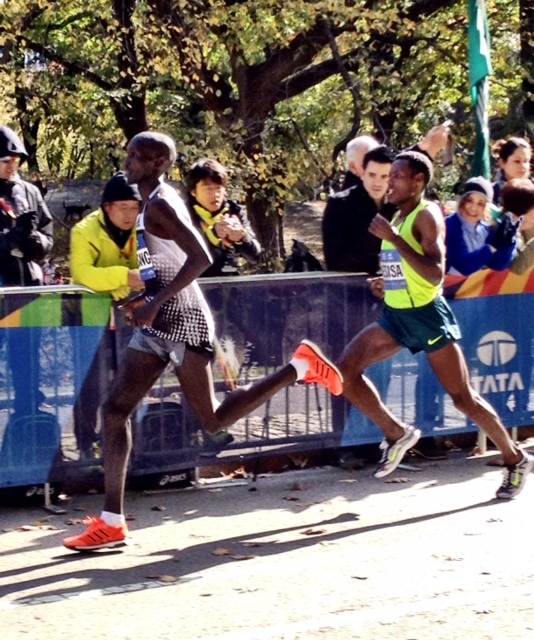 One of the early leaders, Peter Kirui, actually ran with one hand on his chest to keep his top from attacking him. Even when the course found lower ground on Brooklyn’s 4th Avenue, the strong headwinds had the leaders questioning their splits (and perhaps sanity) as the first 5K took 15:51 to pass, a full 30-seconds slower than last year when the winds were also strong and facial. 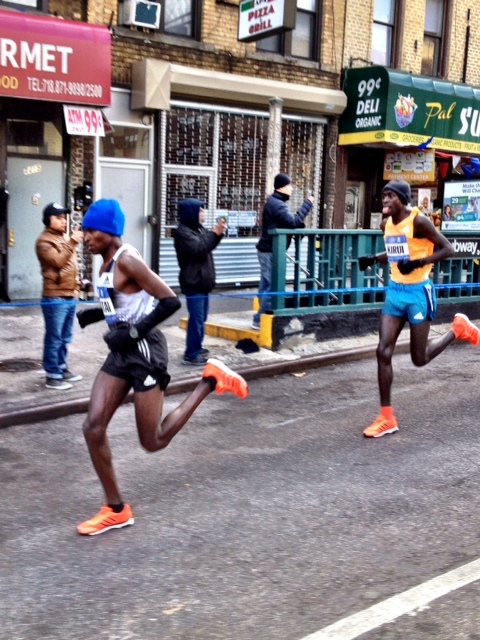 Two-time defender Geoffrey Mutai up 4th Ave. in Brooklyn in th early miles, with Peter Kirui doing his Michael Jordan tongue wag just behind. The lead pack formed up 16 deep seeking shelter from the storm. It included the presence of Americans Meb Keflezighi, Ryan Vail, and Nick Arcianaga, the latter two of whom had prepared well and carried significant goals into the race. 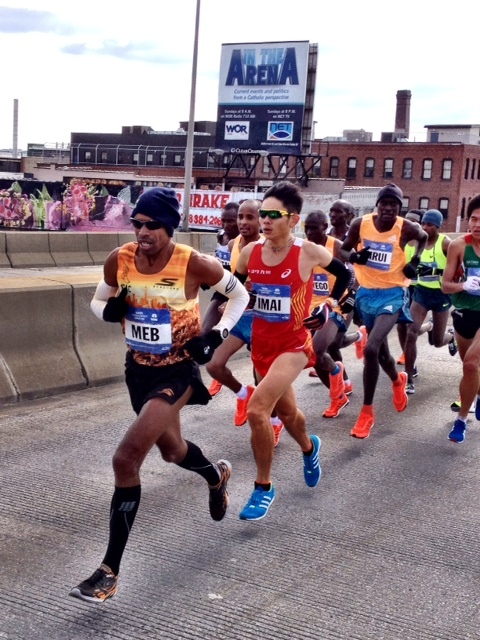 Meb was a little short on sharpening speed after his long victory tour following his emotional win in Boston this spring, but coach Bob Larsen reminded me that nobody gets more out of what he brings to the start line than Meb. And with the poor conditions in play, the 2009 champion’s savvy and experience on the course would become a big advantage as the speed runners from Kenya and Ethiopia would have a weather governor on them throughout the day. Up 4th Avenue in Brooklyn for miles two through eight, two-time champion Geoffrey Mutai of Kenya made his first appearance in the driver’s seat, as did co-favorite Wilson Kipsang, who was shooting for the World Marathon Majors series title and the half-million dollars in bonus money that would attend it. But the only way to take home that bonus was for the London Marathon course record holder to win New York 2014 outright, and this was his first excursion on the tricky five-borough layout. Weaving through the distinctive neighborhoods of Brooklyn one man after another took a pull out front, only to be reeled in by the big-motored pack. Among those testers was Flagstaff-based Nick Arcianaga, seventh place finisher at Boston this spring, who put in his bid at nine miles as the course turned right off Flatbush Avenue and onto Lafayette. 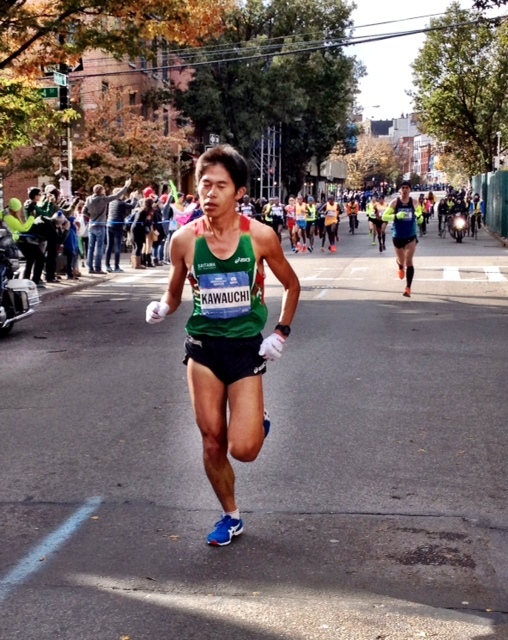 Nick opened a two or three second advantage along the sun-glazed brickfronts, but at 11 miles the famed Japanese “citizen ” runner Yuki Kawauchi sped out to his own small advantage, holding the lead until 20K in his tenth marathon of the year. But like Arcianaga, he, too, was soon swallowed up by the hungry pack of 15. Up onto the Pulaski Bridge at halfway the field split the course in 66:53, slowest first half in New York since the brutally hot and humid day in 1984 when Italy’s Orlando Pizzolatto won the first of his two NYC titles, stopping several times along the way, almost eager to drop out in the sweltering conditions. But with nobody coming up to challenge from behind, the popular Italian was forced to run the whole way to victory, when he would just have easily given up if even one guy would have gone by him. This year the weather could not have been any different as 15 men remained bundled in contention as the course zig-zagged through Queens on the way to the 59th Street Bridge leading to the raucous run up First Avenue in Manhattan. Americans Ryan Vail and Nick Arcianaga, along with Japan’s Yuki Kawauchi all gave ground along this barren stretch. Heading into Manhattan off the Queensborough Bridge, the usual torrid pace up First Avenue was stifled by the strong headwind. 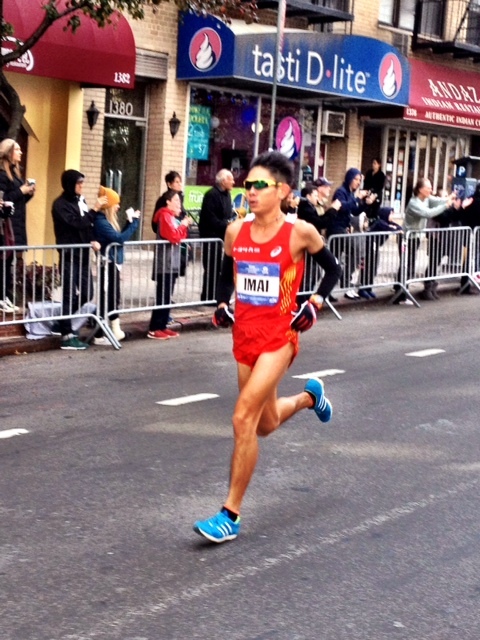 Yet the crowds lining the boulevard remained encouraging as Japan’s Masato Imai, sixth last year in 2:10:45, made something of a break from the pack. But rather than the normal 4:30 paced miles, the three miles up First Avenue’s slot canyon were buffeted and modest. 30K was passed in 1:35:04. That was a 15:35 split from 25K! Mile 19 was clocked in 5:01, shockingly slow for this proving ground of past years. I tapped the dial of my watch to make sure it was working properly. Motoring toward the Willis Avenue Bridge at 20 miles Wilson Kipsang led Mutai, Lelisa Desisa of Ethiopia, Meb, Stephen Kiprotich, Gebre Gebremariam, Lusapho April, Peter Kirui, Micah Kogo, and Michael Kipyego back up to Imai and then past him as the big favorites began clearing their decks for action. 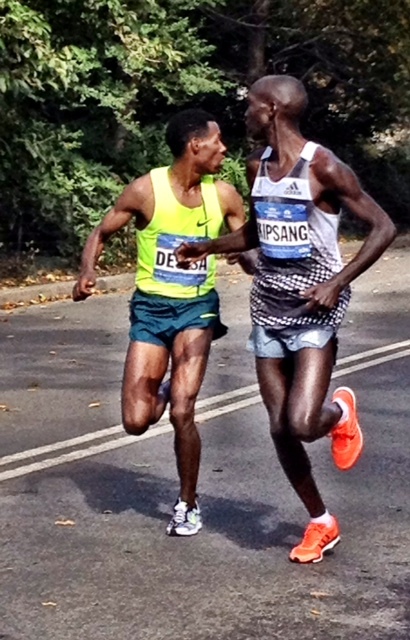 Kipsang hadn’t been on the New York course before, but all Kenyan runners train on rolling hills. He also hails from Muskut, Kenya, a small village not far from Barringo, home village of 2005 New York City champion and ex-world record holder Paul Tergat, the man Wilson idolized growing up. With all he had on the line, there was no fear lurking beneath the big man’s demeanor, only opportunity. Up the grade onto the Willis Avenue Bridge Imai began to give way along with Micah Kogo, the former 10k road record holder and 10,000 meter silver medalist from Beijing 2008. At 20 miles — 1:41:47, a full 3:20 slower than last year — Lusapho April of South Africa, surprise third placer from 2013, came to the front. More confident in himself this year, he promised to run his own race, and not get caught up in how the big names were doing, a mistake he said he made in Boston this spring. Though not fast, the pace had remained unsettled and challenging all day in the hard conditions. Now, knowing that the time for trouble was nearing, the men began wondering who would begin the assault? One mile later we would find out, and at same place where the first real attack of the day arrived in last year’s race under similar conditions. 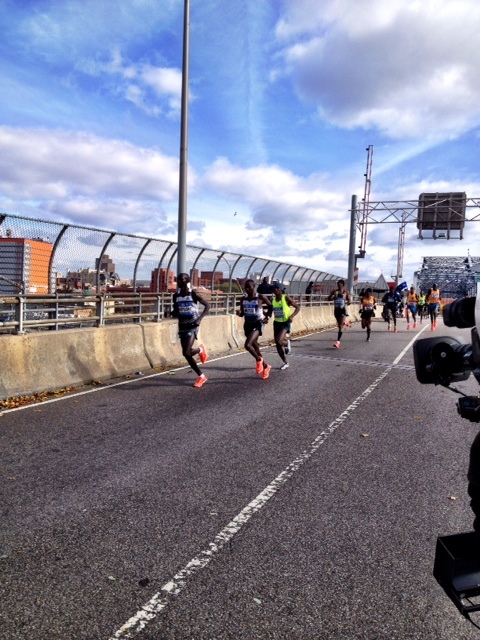 Kipsang shatters the pack off Madison Avenue Bridge at 21 miles. 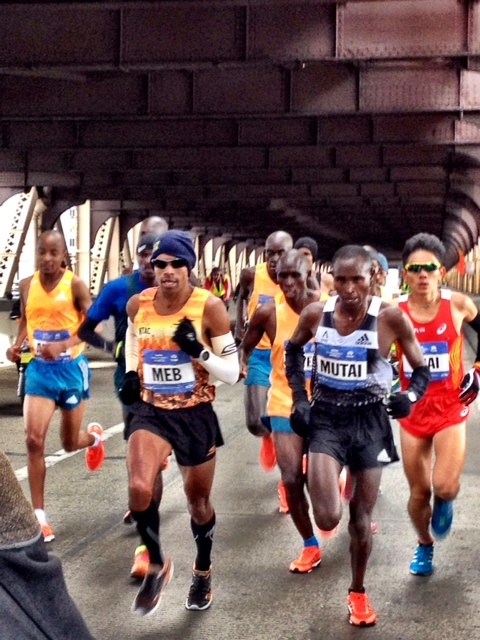 Mutai, Desisa and Gebremariam answer, Meb in 5th. 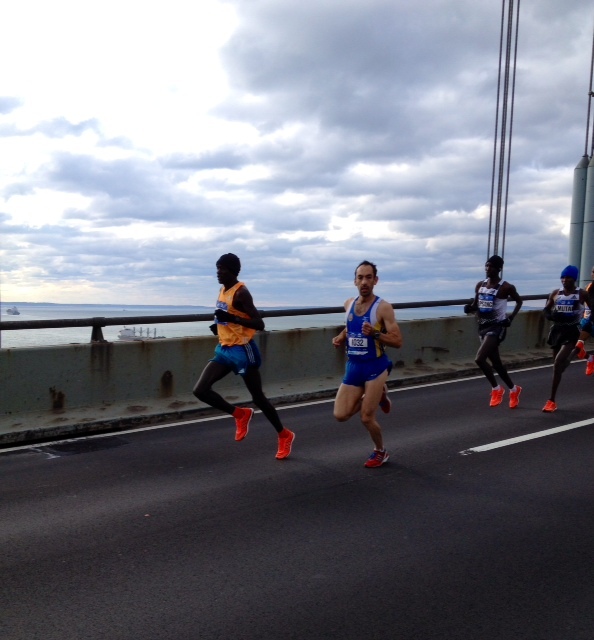 It was only a 4:58 21st mile onto the Madison Avenue Bridge, the final crossing of the five-bridge course. And though not a large span into Harlem, the distance and conditions had softened the field. With a veritable fortune on the line, Wilson Kipsang struck the first blow coming down the ramp off the bridge as he opened his massive stride and began devouring roadway like a man anxious to collect his prize and fame. Immediately the pack strung out behind him like junkies on the ragged edge of need. Ethiopia’s Lelisa Desisa, wearing a yellow vest, showed his hands, if only to remove his gloves, as the the cauldron of pain was entered and the heat turned on high. 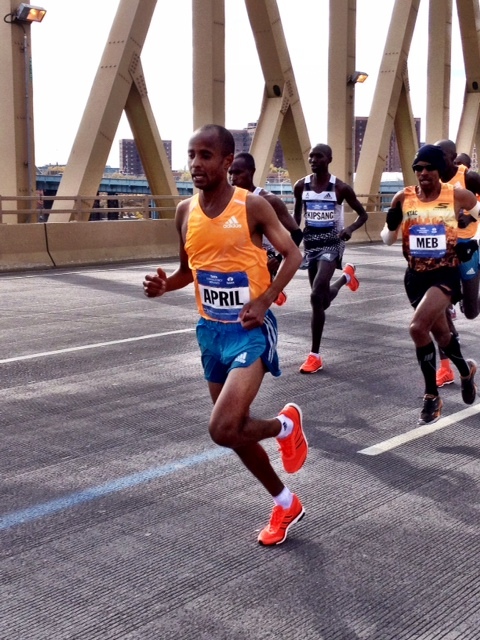 Geoffrey Mutai answered the call, too, as did 2010 NYC champ Gebre Gebremariam, who came into the race light on speed work due to a lingering right hip injury. Meb, Lusapho April, Olympic and World Champion Stephen Kiprotich of Uganda, Peter Kirui and Michael Kipyego all lost touch here. It was down to four with five miles remaining, two Kenyans and two Ethiopians, the classic modern day distance battle! In their matching black and white singlets and orange shoes Mutai and Kipsang might have been figured to be teammates instead of friendly rivals. Instead, they were wearing Adidas kits honoring the late, great Grete Waitz, the nine-time NYC women’s champion who died of cancer in 2011, but left the Active Against Cancer Foundation as another of her legacies. Kipsang looked like a man in a rocking chair, so easy was his stride and countenance. He had reeled in every flyer throughout the day, controlling the chase pack whenever an opponent had gone loose. But now he was making a push of his own, and the other three contenders were working hard to maintain, though Desisa, the 2013 Boston Marathon champion, always looks like a mix-master with his tight hip flexors and flailing arms. Put enough fruits, veggies and yogurt around him and he could churn up a smoothie for you. But don’t let that eggbeater action fool you, he could move over ground with the best of them. 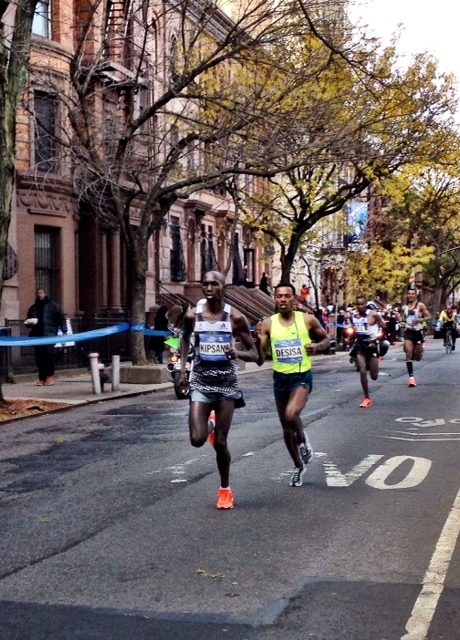 Kipsang nailed the first downwind mile of the day, 22, in a smooth 4:30 as the course turned onto West 124th Street. Alongside, the blue crowd control tape strung along the trees on sidewalks flapped in spastic fury. Then at 1:51:21 on the clock, Mutai and Gebremariam gave way, and Geoffrey Mutai’s hopes for the first NYC three-peat since Alberto Salazar’s in 1980-`82 evaporated. 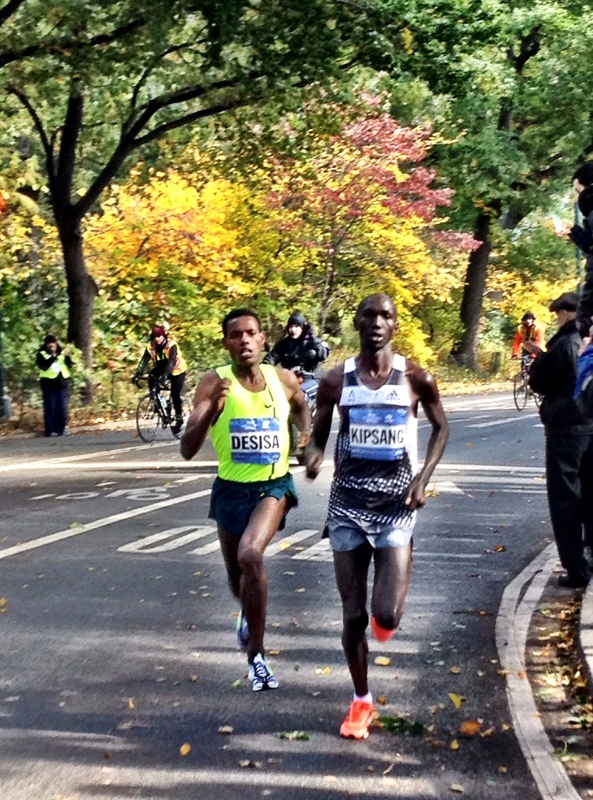 A 4:41 mile down 5th Avenue alongside Central Park cemented the two leaders advantage as GG and Mutai slipped from view. Into Central Park at 90th Street at the famed Reservoir as the clock showed just under two hours of running time. The rolling hills of the park were now bathed in sun and lined with patches of eager New Yorkers anxious to witness this year’s breakaway move. And at least three times Kipsang tried to assuage them. 24 miles fell in 2:00:5o (4:54) and for the first time Kipsang brought his full arsenal to bear, going all in trying to break his Ethiopian rival. With an intimidating release of power the bald strider leveled a hammer blow of pace, enough to discourage many a champion. But the young Ethiopian wouldn’t crack, and once more put himself all but inside the taller man’s hip pocket. One kilometer later on a small incline Kipsang swung for the fences again, as he opened his stride and untethered his heart. But the yellow-clad Desisa, who turned an ankle and dropped out in Boston in defense of his 2013 title, was back in full form, having tuned up for NYC with a win at the BAA Half Marathon October 12th in 61:23 on a similarly rolling course. He took Kipsang’s blow and came back for more. But had yet to attempt an attack of his own. So, was he waiting, or just hanging on? Though his attempts to put away Desisa were showing no gain, Kipsang remained placid, almost dismissive as he reloaded his chambers. He had bored out his weaponry with extra speed work during this training session, he told me, and now he was hoping there was enough ammo in his clip to fire him to victory. Again, it was all or (virtually) nothing for the ex-world record holder who had seen his record fall in Berlin in September. He needed today’s win to secure the $500,000 World Marathon Major Series bonus and New York’s $100,000 first prize. Second place would gain him only $60,000, fully 10X less than victory. 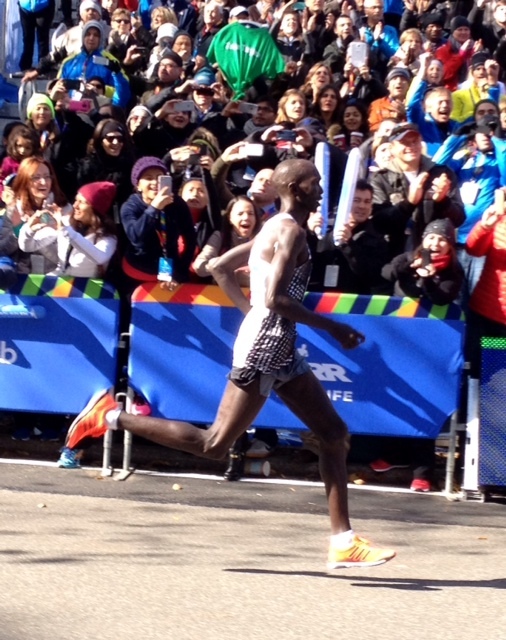 25 miles passed in 2:04:45 (4:55) with Kipsang gaining a meager half stride as the two rushed out of Central Park and onto Central Park South at Fifth Avenue, ground zero for the NYC glitterati. Out of the Park and pressing! Central Park South was lined with fans massed beneath world famous hotel towers whose cost for the weekend might well have been more than the average Kenyan’s yearly salary. No time for such calculations though, as a right turn led Kipsang and Desisa into Columbus Circle before reentering them to the park for the final stretch. Though slightly smaller than previous years due to the chilly conditions, the crowd of New York fans was just as boisterous as ever. The sound was deafening as the two racers came up alongside our bike. Fully caught up in the heat of the battle I missed the 26 mile split as I gave my final TV report from the moto. Then, with less than 385 yards remaining Desisa made his bid for victory as the course bent slightly left for home and glory. Teeth bared he accelerated on the inside as he tried to slingshot past the lanky Kenyan. As he moved even his left arm whipped against his taller opponent’s hip unconsciously hoping to knock the bigger man off stride for just a critical instant. And he managed perhaps a nose in front for a few strides. 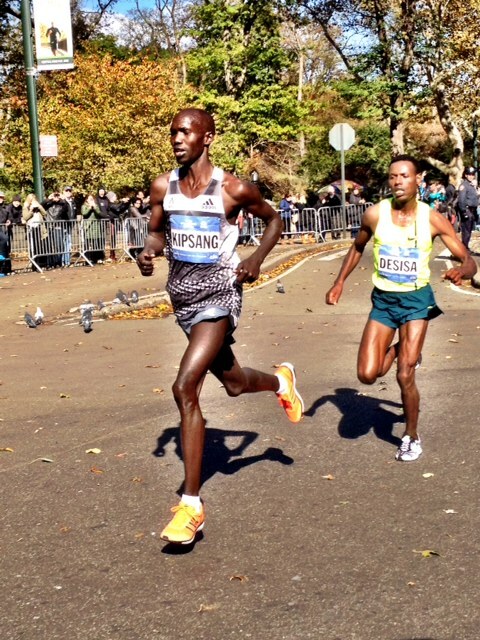 But Kipsang was too close to home to let it slip away now. And away he flew, opening an increasingly growing gap with every hungry stride. Awash in adrenalin, he rode the cheers of the thousands gathered on both sides of the road, then thrust his arms wide in the classic victors pose as he crossed the line. Winner of New York 2014! 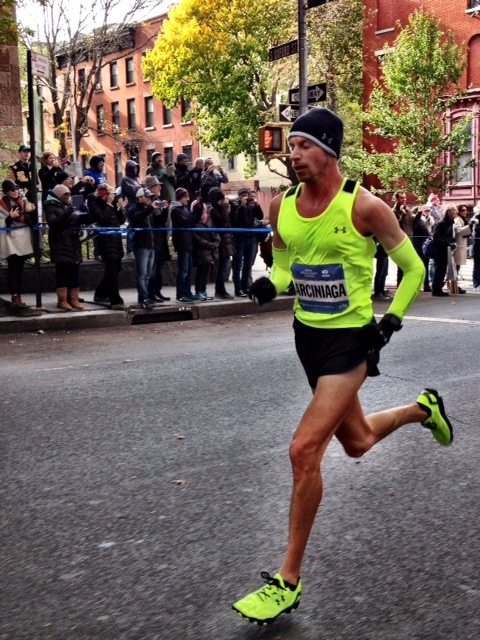 Winner of the 2013-2014 World Marathon Majors! Marking himself, after his course record win in London this spring, as the greatest marathoner in the world. 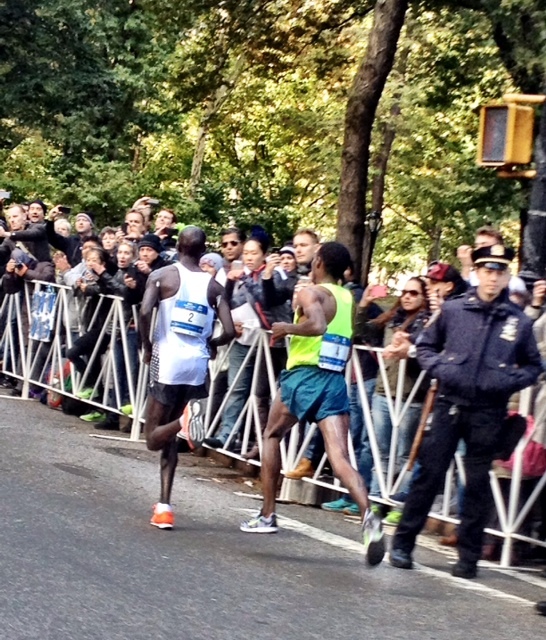 I was at mile 23.5 and as they flew by I knew this would be an epic duel to the line. Excellent recap, Toni. Beautifully worded, charged with adrenaline and accurate down to the minute movements of each athlete. I wish I had heard you narrate this in real time though, as the weather seemed to dampen not just the elite athletes’ speed but the coverage of the event. We home viewers barely heard legendary Paula Radcliffe’s take on the women’s race either because of this. Alas. I was curious to know if you saw Desisa’s alleged vomit during the race. I read in a few places that he had to empty his stomach at some point during the race, which might have explained the rictus he displayed during that last mile against Kipsang. Hopefully next year we’ll be given perfect conditions and the entire men’s race will unfold on TV. I mentioned you briefly in my most recent race recap too — I suffered even COLDER temperatures and similar winds at the Indianapolis Monumental Marathon. They must have migrated northeast from Saturday to Sunday. Kipsang is a joy to watch run. I can’t think of a distance runner that looks that powerful. Toni, great review of the race. I hadn’t paid attention and didn’t know who had won the men’s race and it was fun and exciting to read your coverage — it was gripping and even though I stumbled over the names at first, I was getting a sense f the people, the runners behind the names. Isham is just out of surgery after a scary bike accident. He broke his left leg, everything else totally uninsured, but the break is a complicated one with a prolonged recovery (tibial plateau fracture, compound) and a lot of physical therapy. Just finished talking with him and he’s doing fine, still groggy. Peggie is there now and will stay for a couple of weeks to help and I’ll go up for a week before thanksgiving and maybe again in December or January. Hope all is well with you and Toya. Any review of the women’s race? Since I was riding alongside the lead men, I only heard the women’s race coverage on my headset. You will have to find that story elsewhere. Thanks for the thorough and analytical coverage as usual. I can only hope that one day television coverage becomes as good as Toni’s write up. The TV coverage missed the most exciting parts of the men’s race while covering the women’s finish and awards presentation. Can’t we at least get a split screen? Networks could learn a lot from coverage of the Tour de France which regularly switches between the leaders and all of the other packs in the race. I totally agree here. Hopefully one day TV coverage will be as good as Toni’s report. We are so blessed to be the recipients of Toni’s passion for the sport of running!